I’ve been looking at more of the language enhancements in C# 3.0. In this post I’m going to look at Extensions. There have been many times went a class has needed to be extended, but the additional code just doesn’t sit right on the class itself. In that case a utility or helper class is created to help carry out these mundane tasks without impacting the main class the helper operates on. It may be because the method requires access to classes that would tightly couple the main class to others. It is important to remember that the extension method, like any method on a helper or utility class, cannot access the private or protected members of the class it is helping. For example, take the children’s game Fizz-Buzz which seems to be undergoing a resurgence at the moment. The rules for the method are simple. The program counts from 1 to 100 replacing any value that is divisible by 3 with Fizz and any value that is divisible by 5 with Buzz. If a value happens to be divisible by both 3 and 5 then the output is FizzBuzz. For any other value the number is output. There aren’t actually that many changes (and the example is somewhat trivial). First, in the extension method, the this keyword is placed before the parameter. It indicates that the extension will go on the int (or rather the Int32) class. Second, when the extension method is called there is no reference to the utility class. It is simply called as it it were a method on the class (in this case Int32). Also, note that the parameter is not needed because it is implied by the object on which the extension method is applied. They are identical. So, how does the compiler tell what it needs to be doing? And that’s it. C# just hides the need for the ExtensionAttribute. 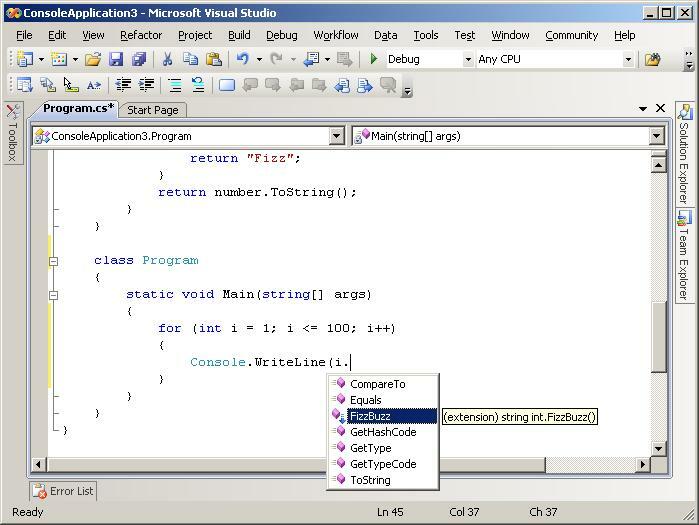 In VB the attribute needs to be explicitly declared on the method. NOTE: This entry was rescued from the Google Cache. The original date was Thursday, 15th March, 2007.